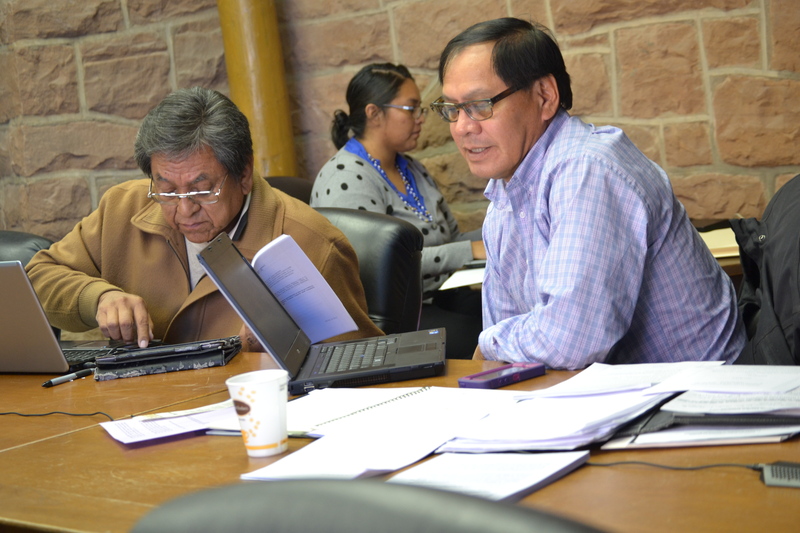 The Navajo Council’s Law & Order Committee is now on Legislation 0289-14, an Act relating to Law & Order, Naabik’iyati, and the Navajo Nation Council; amending Language fluency requirements of the election code at Title 11, section 8(A)(4) (Office of the President/Vice President), section 8(B)(8) (Office of Council Delegate), 8(D)(1)(f), section 8(D0(2)(c) (Land Board), and section 8(D)(3)(e) (Farm Board), which is sponsored by Navajo Council Delegate Lorenzo Curley. Delegate Russell Begaye has conflict of interest and so he cannot vote. And if Delegate Begaye does not vote then the Law and Order Committee loses quorum. We can’t hear the legislation because Delegate Begaye can’t vote and I can’t vote as chairperson. And until we get the other two LOC members here, Committee members Duane Tsinigine and Elmer P. Begay, we have no choice but to defer Legislation 0289-14. Thank you Delegate Curley for being here. The Law & Order Committee then goes to Legislation 0302-14, “Relating to Law and Order and Budget and Finance, accepting Audit Report 14-08, Review of the U.S. Department of Justice Grant awarded to the Tuba City and Kayenta correctional facilities corrective action plan submitted by the Office of the Auditor General and approving the corrective action plan submitted by the Office of the Navajo Nation President and Vice President. This entry was posted in Professional Journal and tagged election code, Law and Order Committee, Navajo language, Navajo Nation, Navajo Nation Council, US Department of Justice by Marley Shebala. Bookmark the permalink.